My mother and my girlfriend Lynn love salmon. 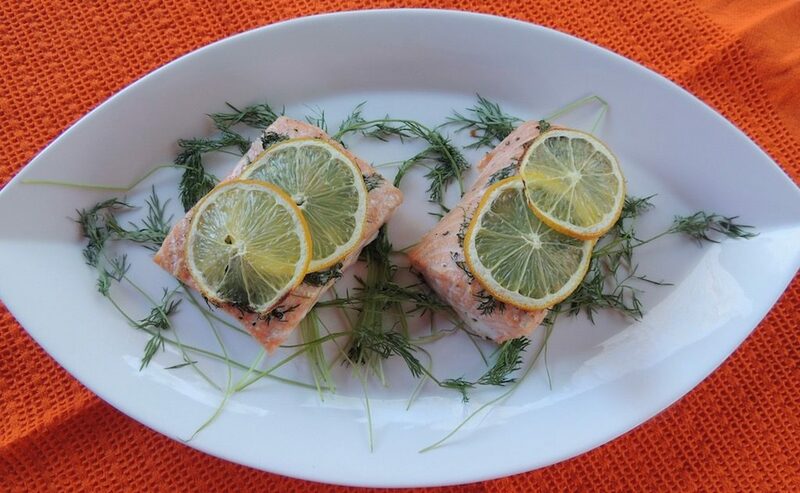 They were talking about recipes at a recent dinner party and they both make a similar version of this Lemon Dill Baked Salmon. Not only is it quick, easy and delicious, but it’s makes a stunning presentation with few ingredients and very little work. I have become very particular about seafood, questioning the quality and the health of farm-raised seafood, especially in locations where there are no protocols for ensuring that appropriate standards are set and used. Whole Foods’ seafood department relies on “traceability from farm or fishery to store.” The goal is not only to know the source, but to verify that these sources are responsibly managed, whether it’s a fish farm or fishery. I rely on them for much of my seafood and the seafood is pristine and delicious. 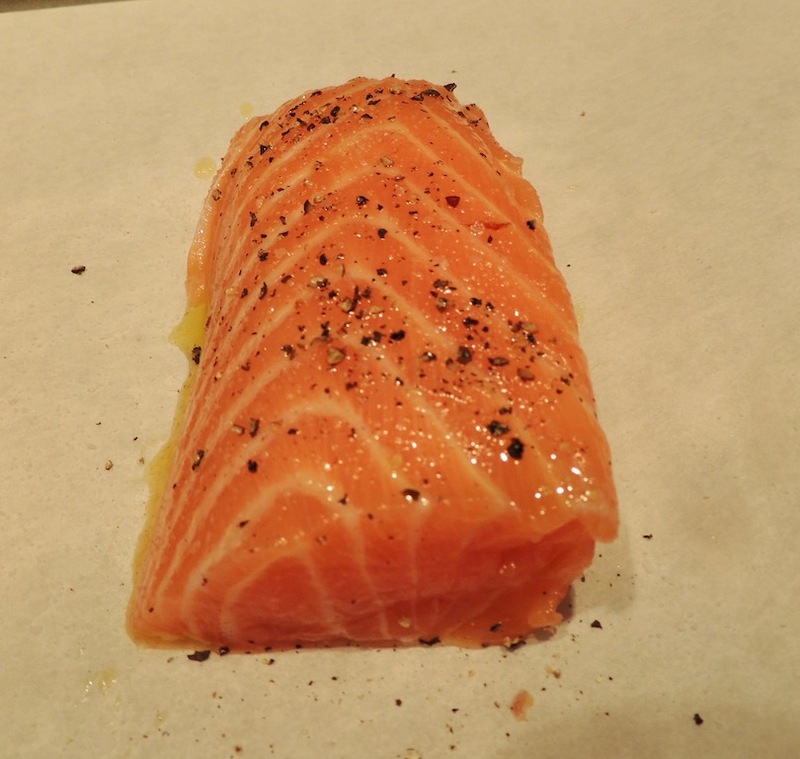 I purchased a beautiful salmon fillet, about 1 1/4 pounds, including the skin, which I removed (the fish monger will always remove the skin for you, just ask). This produced two thick fillets about 5 ounces each and a smaller, thinner piece, not quite 4 ounces, that I chopped up and made into a salmon burger. High heat is the best way to cook fish. It’s quick and not much moisture is lost in the process. 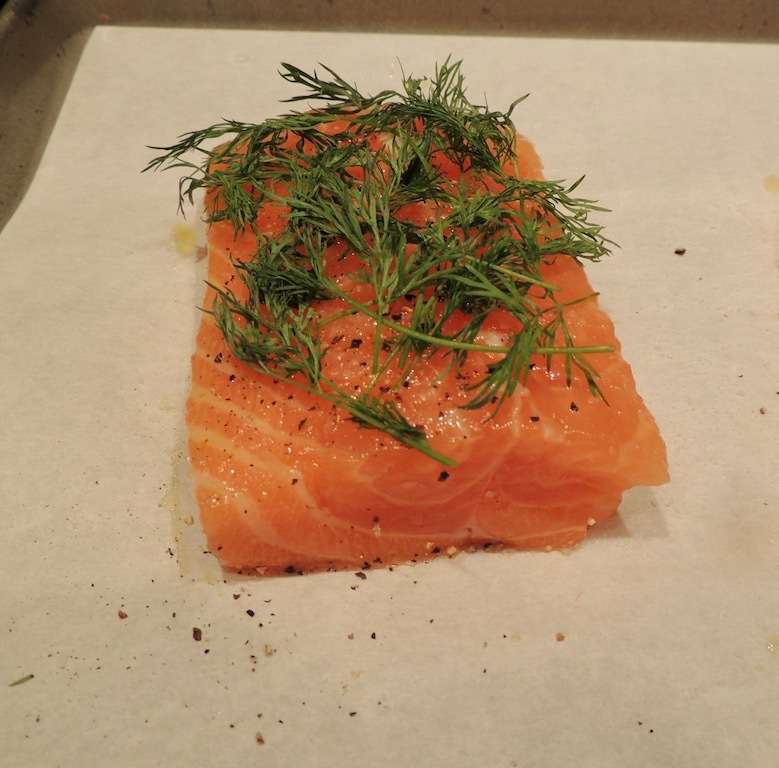 Preheat the oven to 425 degrees F.
Lay the fillets on a lined baking tray, brush with a little olive oil and season with kosher salt and black pepper. Place fresh dill fronds across the top. Cover each with 2 thin slices of lemon. Bake 15 minutes in the preheated oven for medium rare (warm, slightly translucent center) or 20 minutes for a more well done fillet. 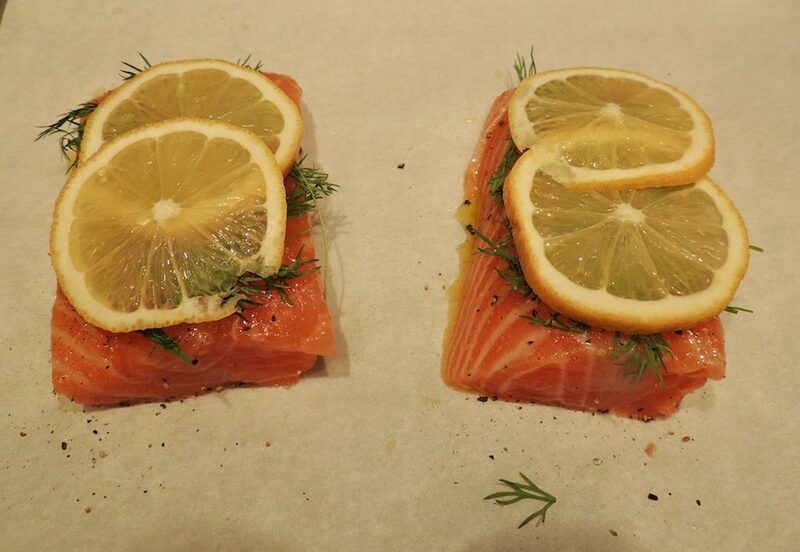 Don’t waste the lemons, give a little squeeze from each slice to brighten the salmon. A quick and easy preparation that is both eye and palate pleasing! Lay the fillets on a lined baking tray, brush with oil and season each with 1/8 teaspoon salt and pepper. Top with dill fronds and 2 lemon slices each. Bake in preheated oven 15 minutes for medium-rare or 20 minutes for medium-well. Squeeze the lemons over the fish. Be sure to get center-cut fillets, these are the thickest. Tuck the skinny end under (after seasoning) for even cooking.